I have to say that this was by far my favorite installation of this series. I absolutely fell in love with and felt for both Thorne and Ian. They both had hard things in their past to get over, but together they managed to realize they could no longer simply ignore those issues if they wanted to be together. There is a lot of love that is shown in this book, not just between our main characters, but brotherly love and family love that comes from the other people we’ve gotten to know from previous books in the series. I would say this is a standalone book, however, to really understand the way Lang Downs works, you’ll have to start at the beginning. 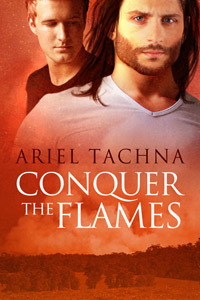 I can’t wait to read more from Ariel Tachna. I will make one note about the narrator besides saying that I like the way he gives each character their own vocal tone so you know who is who and he reads them so well there aren’t any parts that leaves you wondering what just happened because it might’ve been read with the wrong feelings. The narrator does leave very audible swallowing noises in the audio, which I found quite distracting at times. Other than that, well done.